Undergraduates in the UCSC paleomagnetism group help with field and laboratory work to correlate and map large explosive super eruption deposits along the Yellowstone hot spot track. The Department of Earth and Planetary Sciences offers a bachelor of science (B.S.) degree program that is designed for students who intend to pursue professional careers in Earth and planetary sciences, engineering, policy, law, teaching, or business or who otherwise desire the broad, quantitative training available at UCSC. In addition to providing comprehensive preparation in the basic physical sciences, and particular breadth and depth in Earth and planetary sciences, the curriculum is structured to prepare students for the competitive graduate school and career marketplace. Along with the standard Earth sciences major, we offer concentrations in environmental geology, ocean sciences, planetary sciences, and science education, and combined majors with environmental studies and anthropology are available. There is also a minor in Earth sciences. The core of the major includes calculus, physics, chemistry, and a group of comprehensive Earth and planetary sciences courses. For the standard B.S., students then select at least four additional courses from a diverse list of upper-division electives, with at least two that involve significant laboratory or field data acquisition and analysis. 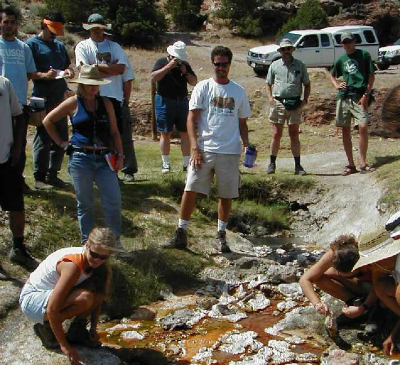 These electives, often in combination with additional upper-division courses from E&PS or related departments, provide the student with expertise in one or more subdisciplines within Earth sciences. Elective distributions can be designed to emphasize earthquake and faulting studies, Earth surface processes, Earth system sciences, geologic hazards, geology, crustal and deep-Earth geophysics, marine geophysics, and water resources. Four formal concentrations, all with specific course requirements and leading to an Earth sciences B.S. are available: environmental geology, ocean sciences, science education, and planetary sciences. A senior comprehensive experience, or capstone (senior thesis, or geologic field camp, intensive internship experience, or exemplary performance in a graduate course), is required of all majors.